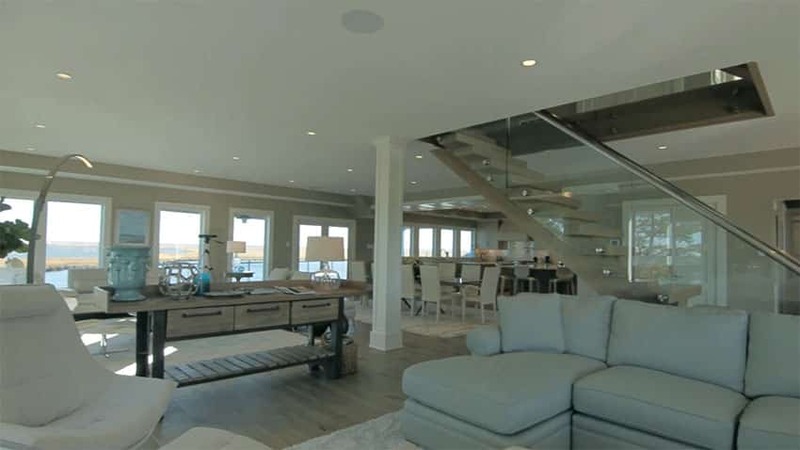 This luxury 4 Story House Design on the waterfront features a stunning 7 bedroom and 5 bathroom home with over 6000 sq ft. of living space. 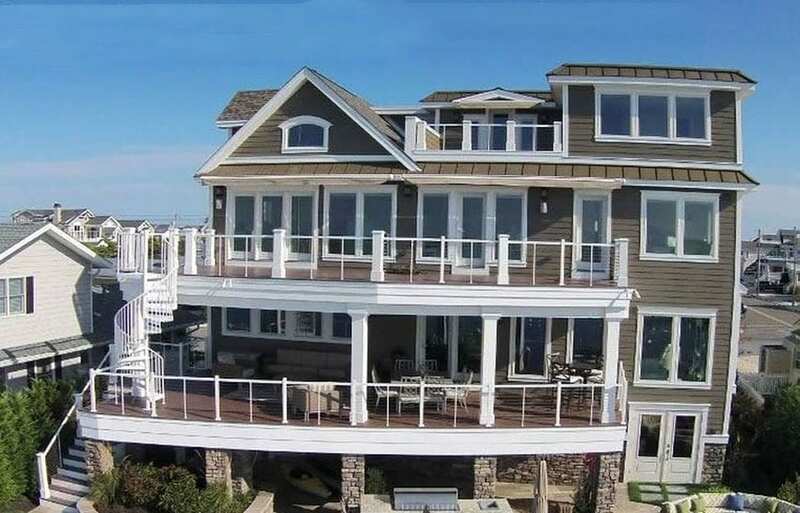 High end finishes are found throughout the home with amazing bay views from 3 separate decks. 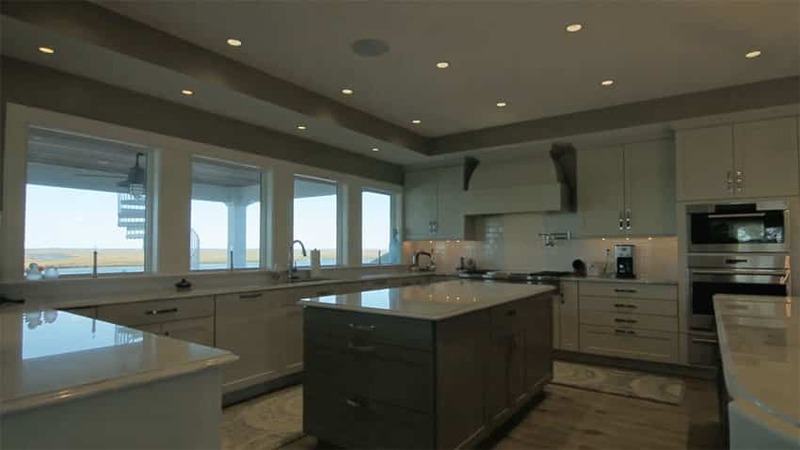 The home has outstanding features such as a gourmet 430 square foot custom kitchen with 10′ x 6′ granite island, top of the line appliances and custom Italian wood grain ceramic tiles. 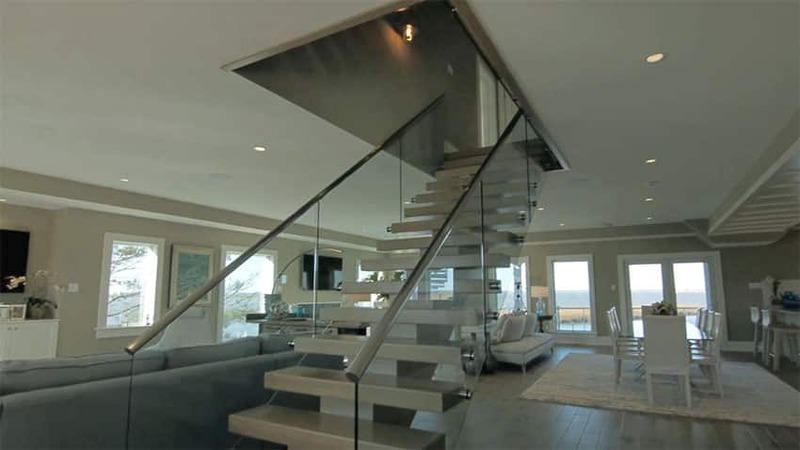 Practically every room in this house has stunning bay or ocean views. 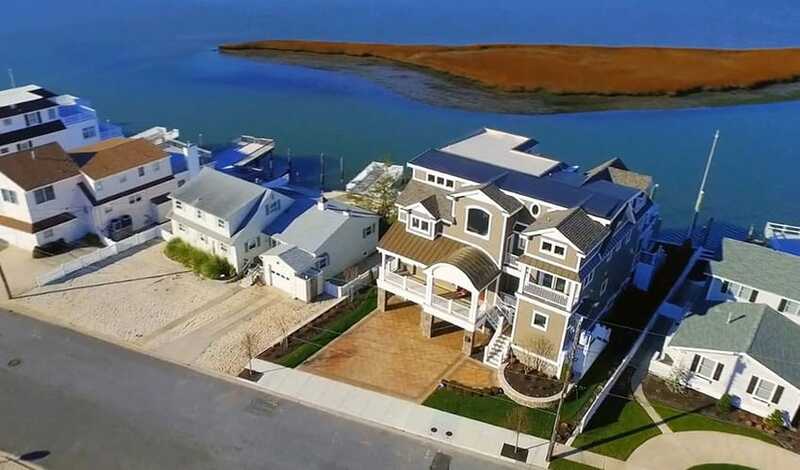 As you can see in the picture above this waterfront home stands out with its premier location and access to boating, fishing, paddle boarding and kayaking the bay and estuary. 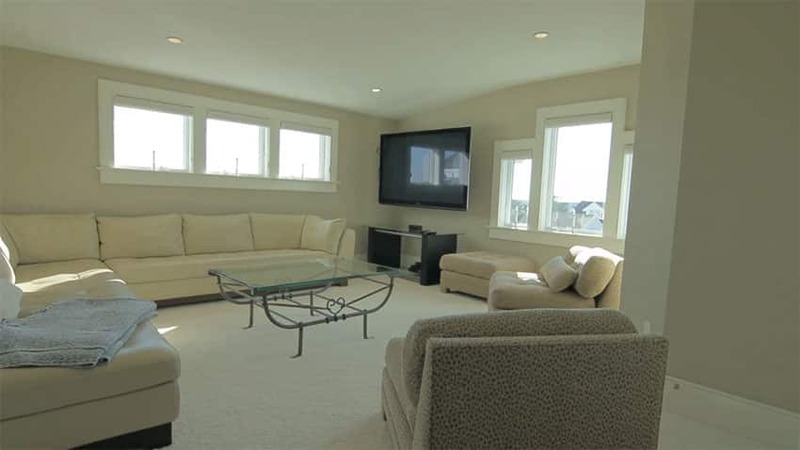 The home sits on a 73’wide waterfront lot with all the indoor and outdoor living areas facing the bay views. As we approach the front of the 4 story home one can see the stairs leading to the second story foyer entrance. The 1st story garage offers an additional kitchen, laundry area, storage and two indoor-outdoor showers. The house looks charming and has excellent curb appeal with its stacked stone pillars and wall with attractive wood siding and white railings. The main front entrance to the home is up a flight of stairs on the second floor. Upon entering to the foyer entrance guests are greeted with stunning views of the bay, a floating staircase and the impressive custom Italian wood grain ceramic tile flooring. The living room is directly off the main entrance and is well appointed with a modern gas fireplace, luxury decor and views from every window. The room is furnished with white modern couches, two modern high backed curved chairs, and a large area rug over the Italian ceramic tile. Another image of the living room with modern furniture including a stylish three level glass coffee table. A view of the open concept layout of the 1160 square foot great room. The home is wire with all-house audio system that is controlled by an IPad station. In addition there’s a four stop elevator so one can avoid hauling items up the stairs. The large wall of Anderson 400 smart sun windows provides an amazing vantage point with access to a large deck terrace. The transitional dining area is just off the large gourmet kitchen. The dining table shown above has room to accommodate up to ten guests. 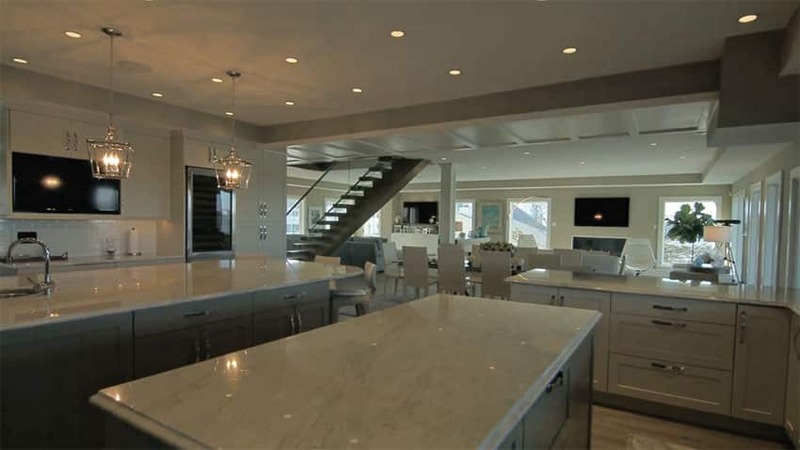 The fabulous custom kitchen is the epitome of luxury with 430 square feet of space including multiple islands. Custom white cabinetry looks attractive against the level 6 granite countertops. A light gray color island contrasts against the white of the base cabinetry and offers additional food prep surface to create the ideal work triangle. From this vantage you can see the layout of the kitchen islands with plenty of counter space. A wine refrigerator is installed in to the far wall next to a large butler’s pantry. 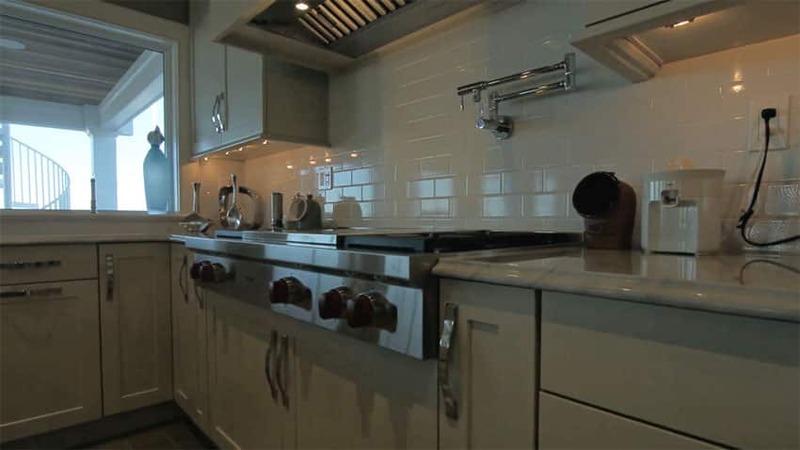 The kitchen’s equipped with high-end appliances from Wolfe, Subzero, and Miele. In the picture above you can see a picture of the Wolfe gas range framed by the white cabinetry and white subway tile back splash. LED under cabinet lighting, provides additional illumination for the countertops. 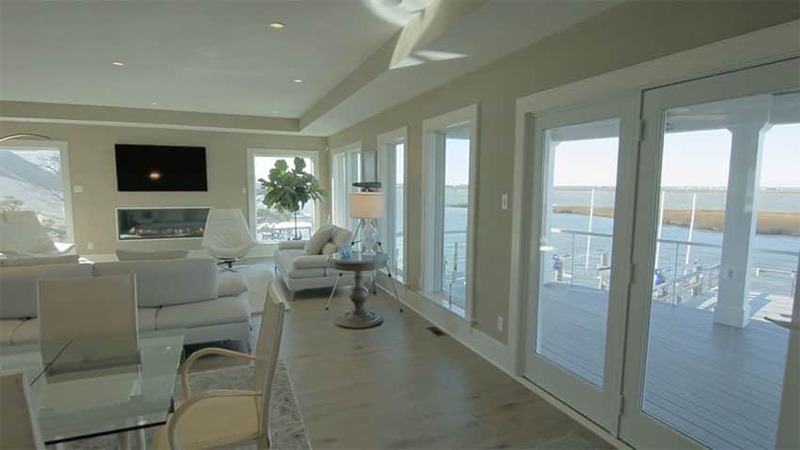 The luxury master suite features expansive bayside water views, high ceiling, and custom woodworking & paneling. A doorway leads out to a balcony deck with a stainless steel cable railing system to help maximize the views. The master suite bathroom has marble tile throughout, with a glass enclosed shower with a mosaic tile inlay, and a large soaking tub. The upstairs cream color living room area has large sectional sofa with several additional chairs. a large flat screen TV hung from the wall makes this a great spot to relax or socialize with friends and family. 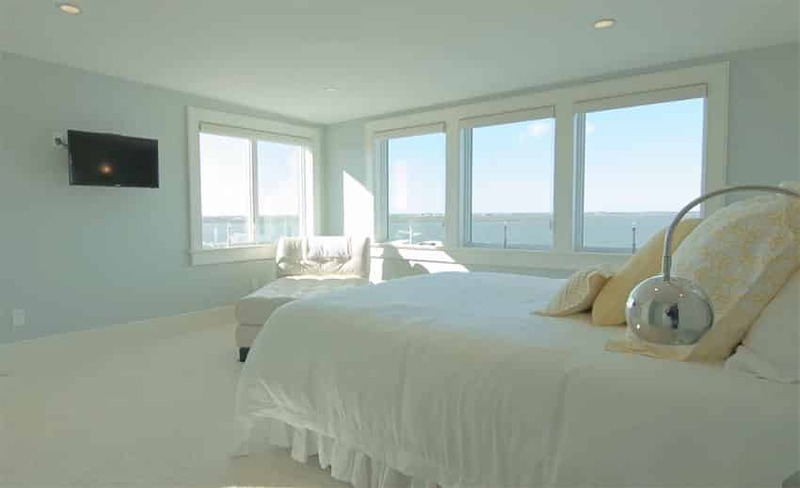 A guest bedroom with a lovely waterfront view of the estuary and bay. The room is elegantly decorated with soft fabrics and white furniture pieces. This corner bedroom has a commanding view of the waterfront. The room is furnished with a tufted daybed and decorated with shades of blue against an off white background. This inner bedroom has a nautical theme and is a little bit darker with smaller windows than the others. 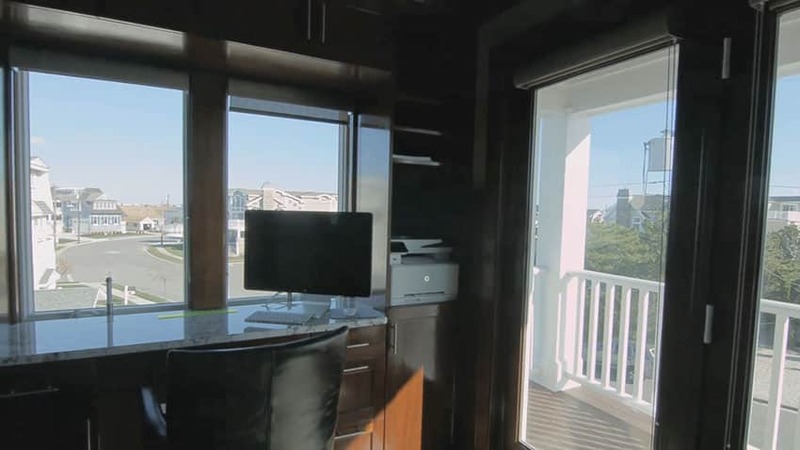 A home office at the front of the house on an upper level provides a distant ocean view and private balcony. A calming bedroom decorated with a neutral color scheme and soft fabrics. The bedroom has a cute window seat against the wall as well as several windows to let in plenty of natural light. 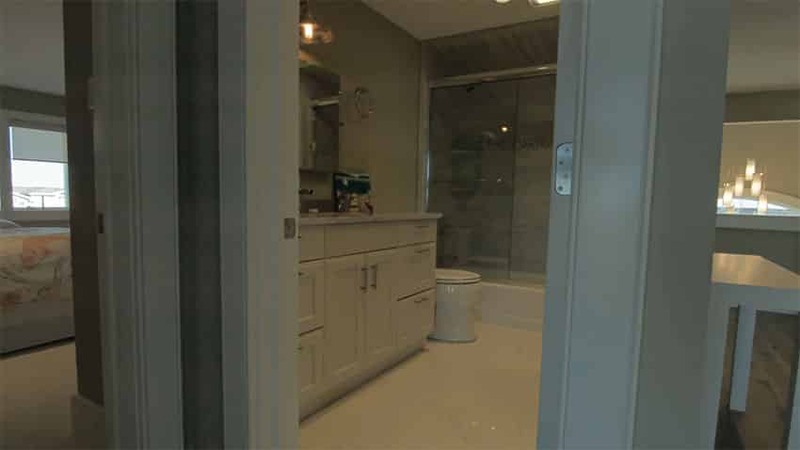 The guest bathroom offers a white vanity with step in glass shower. To the right of the bathroom lies the staircase and to the left is one of the spare bedrooms. 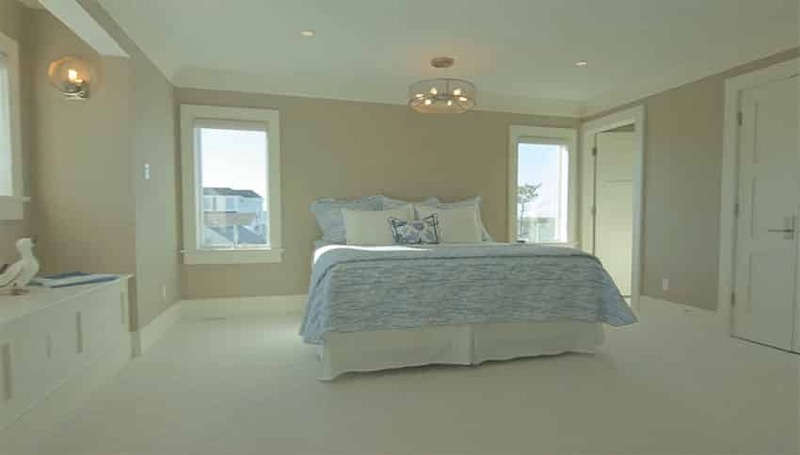 A top floor bedroom painted in a light blue color with a great view of the water. A modern metal light fixture hangs to the side of the bed and another daybed is situated in the corner to take in the warm sunlight. The view from one of the home’s three decks at night. 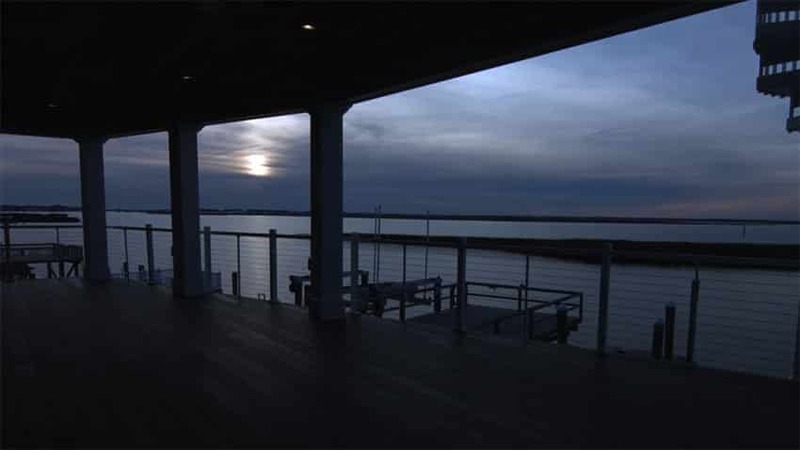 The low profile of the stainless steel railing system really lets one fully appreciate the stunning views. 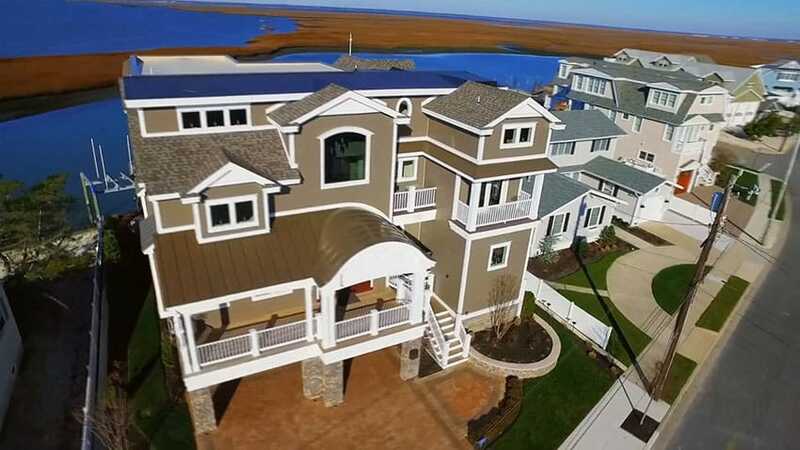 From this aerial view of the 4 story home one can see the exterior of the home including the backyard boat docks. The backyard of the house features a large patio with a circular fire pit that accommodates up to 10 people. In addition there’s an outdoor kitchen and large outdoor dining table. From this view you can see the large upper floor decks that make this home ideal for entertaining. 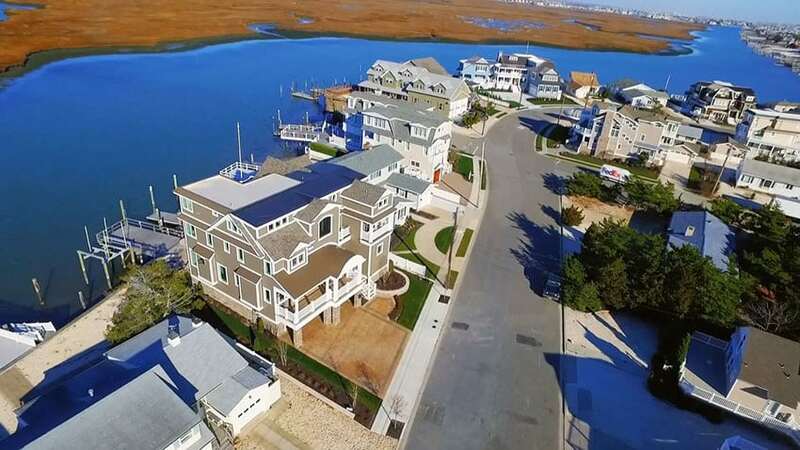 Some standout features of the backyard are the 12,000 pound boat lift, two boat slips, jet ski ramps and a 28 ft. by 10 ft. fishing dock. 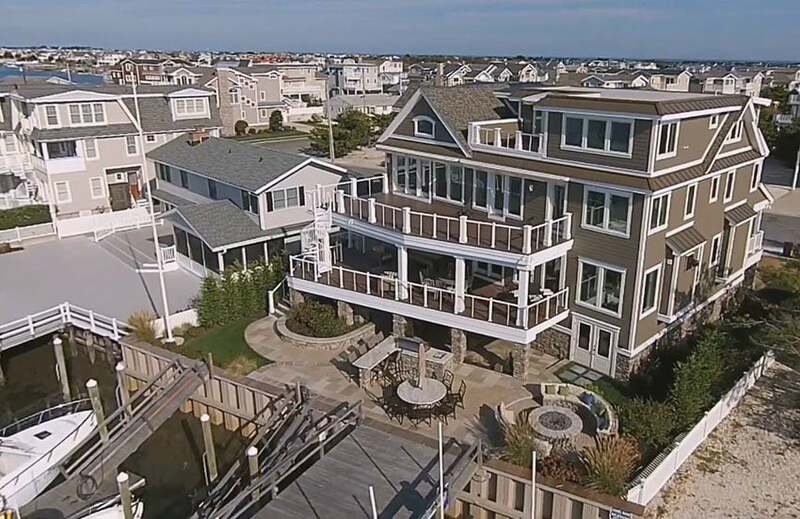 A close-up view of the 3 separate level decks with a total living space of over 1500 square feet making up this 4 story house design. Two large 38’x20′ bay view decks and a smaller upper deck offer multiple locations to relax and enjoy your favorite cocktail. 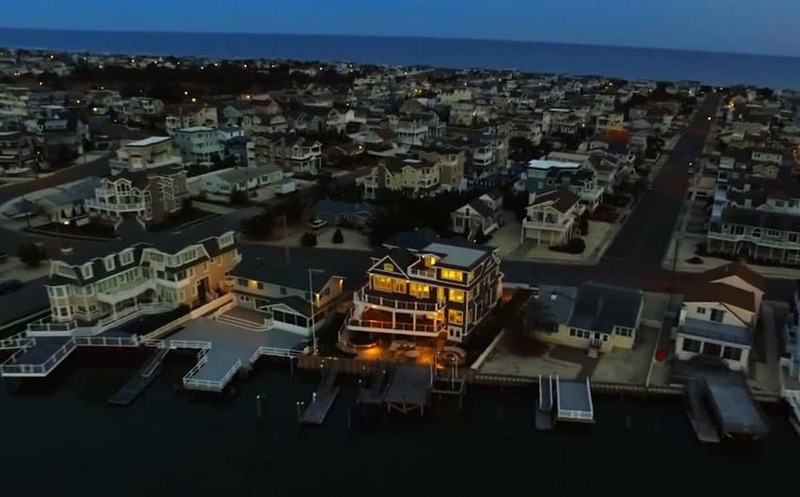 This video features “SunsetDrive” (https://vimeo.com/153827074) by Holly Rennie which is licensed under CC by: http://creativecommons.org/licenses/by/3.0/ – Changes made include removing some content, adding screenshots and additional music.